Every Joyful Occasions wedding is special and unique, tailored to the ceremony dreams of brides and grooms! Finding a marriage celebrant is easy. Finding the right one is not. We were so happy when we met Joy and instantly knew she would be perfect for our ceremony. We were going for simple, fun, relaxed and all about us as a couple and our young sons. Joy helped bring together both our ideas and created with us a wonderfully fun and friendly ceremony. She made great suggestions that had us thinking outside the box, ensured our sons were involved as well as our guests. She also did something I’ve never known another celebrant to do. She took photos on the day ‘just in case’. Well that in case turned out to be very much needed. Our photographer didn’t do as asked and missed taking photos of most of the set up of our reception. So much was missed and we were devastated. Without us even knowing, Joy captured all the personal touches I’d taken months to create and gave the photos to us as a gift. Lifesaver! That’s Joy. As wonderful a woman as you could find. Celebrant Joy: Loved, loved, loved the creativity that Ali and Alex put into their wedding ceremony and celebration. So many handmade touches which made their wedding day unique and a treasured memory. Loved seeing the Bride and Groom and their two sons hand-in-hand Jumping for Joy on the trampoline within minutes of their marriage register signing – a very special moment! See more photos on Instagram. 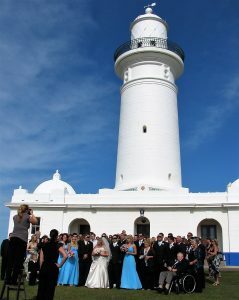 Love a Sydney Harbour foreshore wedding! Thank you so much for being our celebrant. I felt so comfortable when we met and you made our wedding day so special. Despite Kathy being overseas, you made planning our ceremony easy and relaxed! You were so patient, so kind, so funny, so warm, so professional – you have a special gift as a celebrant! I just wanted to send you a small note to say congratulations and a huge thank you for your service and collaboration for the wonderful wedding of Kate & Guy. It was utterly terrific to be able to do an event with you and I know that the couple were tickled pink with your service, professionalism and the overall cohesive ceremony that you both managed to conduct (with a trainee celebrant). It was nothing short of an absolute pleasure working with you in the lead-up to the event and on the day and I truly hope that I am fortunate enough to be on board for many more events with you to come in the future. Thankyou so much for all your help and assistance for making our wedding day, a dream come true! We were blessed to have you marry us. Your guidance was wonderful and helped to steer us through everything leading up to and on our wedding day. Oh! And the photo your took of us sharing a quiet moment as we walked away to have our official photos is one of our favorites from the day. Wedding and Naming Ceremony in one! Thanks so much for officiating at our wedding and Elliot’s baby naming ceremony on Sunday. It was such a perfect day & exactly how I hoped it would go, all thanks to yourself & others involved. I must say one of the biggest compliments I keep receiving about Sunday was about how good you were, professional & knowing. Our official Marriage Certificate arrived yesterday so now I can get on to the fun job of changing my name – thanks for your guidance sheet on how to do this! Celebrant Joy: M What a beautiful family! Several weeks later they arrived unannounced with a beautiful bouquet of flowers as added thanks! We found our dream Celebrant at another wedding! I am so glad I attended a wedding ceremony that you conducted and found my ideal Celebrant and you were happy to travel to the NSW Central Coast. As you know, I have worked at many ceremonies as a photographer and had not witnessed a Celebrant that ticked all the boxes – until I saw you! We had a fantastic wedding day and I had so many people telling me how great our Celebrant was!! One friend said it was the best ceremony she has ever seen! Everyone loved the fact that you incorporated our story into the ceremony and really liked the sand ceremony and Caidance’s bracelet gift. They said it was the most relaxed and personal ceremony. We loved it too! I have received your package with the ceremony booklet and photos! Thank you so much! I had tossed and turned worrying if we got a nice formal photo of the 3 of us and you have confirmed it for me! And it’s beautiful! Our ceremony booklet is amazing! I love it! We loved everything about our ceremony! I just wanted to say another massive thankyou for how wonderful you made our Wedding Day and Wedding Ceremony. I had no idea we had brides trying to gate crash the venue and a few other little things you fixed up! You have been so lovely on every meeting and kept me calm and relaxed. Celebrant Joy tip – when hiring wedding ceremony venues, check your rights and what support the venue hire company/council gives to ensure your exclusive rights. Joy! Thank you so much for our beautiful, relaxed and fun wedding ceremony. And added thanks for your beautiful ceremony keepsake book and photos! We can’t say thank you enough for everything you’ve done; you really did help ease some of the stress and worry – everything went so well on the day!!! I had quite a few people ask me how I knew you – and they were all very surprised to learn that we didn’t actually know you and that we had only ever met with regards to the ceremony. So thank you for that as well, you really did make it very easy and enjoyable! I am writing to give you many many, many thanks and jubilation for our fantastic wedding day. I thoroughly enjoyed myself and was extremely pleased with the way the ceremony was conducted. It was professional (which I feel we needed as I was a bundle of nerves and you lead us along with kid gloves). It was joyous, (everyone was giggling with Scotty’s prayer). It was personal, (just like having a friend along to bring me drinks and take some happy snaps). You are a star, a bright shining light that we can follow & feel comfortable with. Mum loved the words in the ceremony & Aunty Pat was so happy that there was a catholic connection along the line. We appreciate every thing you did to make our day purrrrrrrfect. Thanks sooooo much, Annemaree, Stephen and Scott. Celebrant Joy – yes, religious readings, cultural rituals and other ideas can be included in your ceremony if you wish– your day, your way! Going to the Chapel and we’re going to get married! Oh Joy! Thank you so much for travelling to Melbourne to officiate at our wedding. The wedding ceremony was so beautiful, filled with love and funny stories. Loved how you included the beautiful story of our engagement which ended up on Melbourne radio (and our wedding theme!) plus for allowing Ben to say his wedding vows – the whole 200+ words – from his heart. Hardly a dry eye in the chapel! Thanks for suggesting we formally welcome Hallie to our family as part of the ceremony – again, many tears of happiness! Your photos and ceremony book are treasured memories too! Celebrant Joy: This ceremony was so much fun! Groom Ben was amazing – I was a little nervous as the Celebrant as he wanted to say his vows from the heart – and they were the longest vows I have ever read! He delivered them perfectly with such love and passion – truly beautiful and a forever memory! 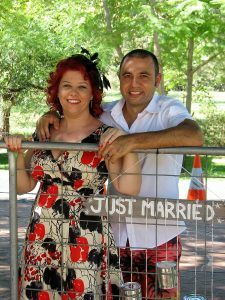 We chose to elope and luckily, we found Joy of Joyful Occasions to officiate and to provide two witnesses for our Sydney ceremony. Our elopement ceremony was intimate and so very moving – it will always be a most special memory in our hearts. Joy also took photos for us, so we have them as a forever memory! Elope with Joyful Occasions – it will be a beautiful, memorable ceremony and so easy to organise from overseas! Joy was a supportive and caring celebrant at my Mother’s funeral. Her personal touch and attention to detail impressed everyone. A local retired minister in the congregation was especially amazed by the wonderful service. 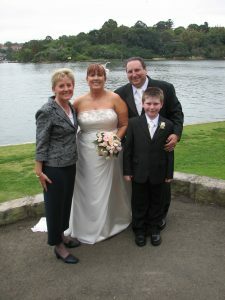 Joy also joined us as the celebrant at our son’s wedding a few years later. Again her advice and special touches made this an amazing joyous occasion. The ceremony included a beautiful love letter box ritual plus a candle lighting for those departed.